Circular regarding Revision of Entry Fees at all the ticketed monuments under A.S.I. This gigantic Mosque built and completed by Sikandar Shah (c.1358-1390 AD) in 1369 AD is the most remarkable existing example of Muslim architecture of that period. It is a Quadrangular building, consisting of cloisters which surrounded a central area of the same form. It extends 507½ feet from north to south and 285½ feet from east to west. On the east side, through which the shrine is entered by an insignificant door, the cloisters are 38 feet wide and have 3 aisles. The total number of domes covering the cloisters was 306 in all. The upper chamber (Badshah-Ka-Takht) which is situated to the north of the Central hall, was apparently intended to provide separate accommodation for the King and his family during services. The prayer niches on this area in the west wall are embellished with beautiful ornamental Tughra inscriptions. To the northern half of the back wall of the mosque and west of the Badshah-Ka-Takht lies a roofless room, 42 feet square, known as Sikandar Shah's tomb. As the wall is measured 22 Bengali yards i.e. 42 feet in its height it is called Baisgazi wall. 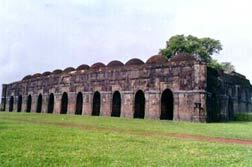 This massive brick built wall with ornamental cornices and niches was probably built during the reign of Sultan Nasiruddin Mahmud Shah (c.1442-1459 AD) as a protective wall for the palace area of the Kingdom of Gaur. It has a tapering shape and 15 feet wide at base and near 9 feet at top. This is a massive rectangular brick built Mosque but stone pillars in three aisles with a corridor. 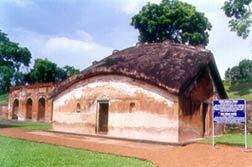 It has eleven arched openings and was roofed by 44 hemispheric domes. 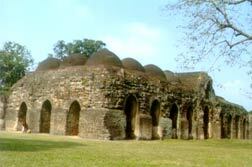 It has earned the name Bara Sona Masjid (Great Golden Mosque) as its domes were originally gilded with gold. It was built by Sultan Nasrat Shah in c.1526 AD. It is a mound with a large number of stone pillars scattered throughout. The remains seem to indicate a square pillared corridor enclosing a courtyard. Recent trial trenching has shown the existence of structural activities mainly in brick in different stages. An exquisite stone pillar has been found from the trench datable to c.11th century AD. 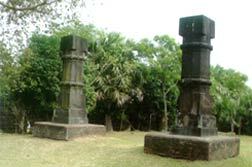 Besides this, the pillars scattered at the mound have ornamental features indicative of Hindu affiliations. 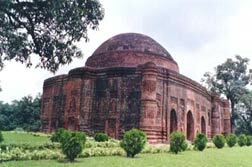 Therefore the mound appears to retain vestiges of pre-Muslim period occupations and Cunningham wrongly identified it as Belbari Madrasa. c.11th - 12th century AD. Erected possibly by Sultan Yusuf Shah this brick built Mosque (damaged) is resting on stone pillars upto the height of springing point of its single dome. 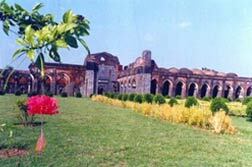 The verandah in front, has three arched entrances and noted for use of glazed tiles lending a graceful appearance. Three doorways lead into the interior square hall. 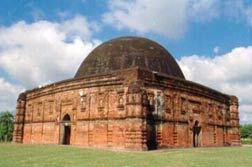 This is a single domed brick structure, called as Mosque. 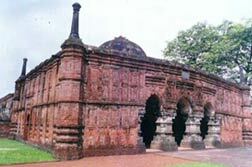 But it is evidently a Mausoleum architecturally similar to Eklakhi Mausoleum at Pandua, besides there is no mihrab in it. 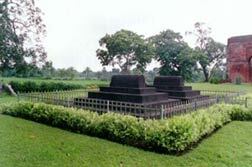 It perhaps served the purpose of the tomb of Sultan Jalaluddin Muhammad (1415-31). It was possibly built in c.15th century AD. 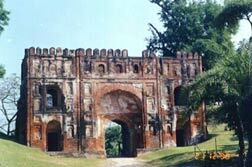 This impressive gateway built of brick was probably built by Sultan Barbak Shah (c.1459-74 AD) and served as the main entrance on north into the citadel of Gaur. It was also called 'Salami Gate' as salutes were fired from its sides. The facade of the gateway measures 73' 4" in breadth and rises to a height of 60'. 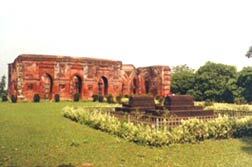 The gateway represents the height of excellence that the brick masons of Bengal were capable of achieving. The archway which is 34' high upto the apex of the pointed arch, is flanked by a pylon like buttress, one on each side of the frontage and guarding the portal. The archway between the two pylons provides a deep and wide portico containing the arched opening, which leads into a central vaulted passage, with a guard room on each side. The entire structure has beautiful terracotta ornamentation and a guard example of the intermingling of Islamic thought and regional characteristic features. Alternately known as Firoza Minar or 'Blue Tower' this tower 25.60 m high with spiral staircase having 73 steps was probably constructed by Saifuddin Firoz an Abyssinian commander of the royal forces who became the Sultan by avenging the killing of Sultan Jalaluddin Fath Shah, the last ruler of the Iliyas Shahi dynasty. From the foot of the door the tower rises in three storeys of twelve sides, each storey demarcated by ornamental bands. The fourth and fifth storeys are circular with reduced diameter. The last storey originally an open arched room covered by a dome has been changed into an open flat roof by some restorer. 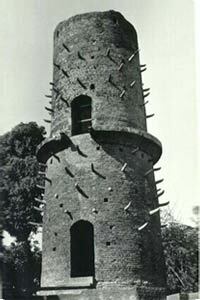 This is considered as a victory tower as its builder is credited with many victories in battles. 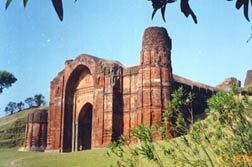 Scholars attribute it as a Bengali version of the Qutb Minar (1486 - 89 AD). This brick built single domed structure with stone works at the base was erected during the reign of Sultan Alauddin Hussain Shah in 1512 AD. This was used as a small gateway to the fort. On both sides of the doors on the east and west there are fluted columns of brickwork and the building has decorated cornice all round. It is a massive structure built of rubble stone and bricks with pillars of stone constituting a vaulted central naïve with three aisles. 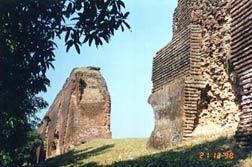 It was probably built by Sultan Jalaluddin Fath Shah in 1484 AD suggested by an inscription found nearby. It consists of a centre room extending from the front to the back wall. The Mosque though badly robbed of its stone still inspires a feeling of its past grandeur. This magnificent arched gateway top part of which collapsed long back is the central gate in the south wall of the city of Gaur. The gateway had a brick arch 30 feet high and 16 feet vine metes span. There are battlements on the east and west sides. It approximates in style to Delhi architecture and was probably built between the date of the earliest Muslim inscription found in Gaur, 1235 i.e. the time of Iltutmish and the death of Alauddin Khalji in 1315 when the influence of Delhi was strong in Lakhnauti (Gaur). However, there is difference of opinion among scholars about its date. The Mosque was probably built by Sultan Yusuf Shah (c.1474-81 AD) but traditionally ascribed to a Royal Courtesan without much ground. 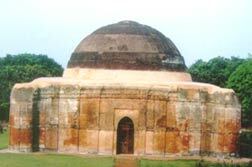 This is a single domed building with a square chamber and a corridor in front. There are three arched entrances on the east and sides. It was once covered with a enamelled brick work of four colours, green, yellow, blue and white lending a colourful appearance. It appears to have been built by Shah Suja, brother of the Mughal emperor Aurangzeb in c.1655 AD. 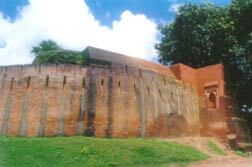 This large double storeyed gate, with guards room on sides and a Naqqar Khana (drummers chamber) on top is built of brick and stone and is the eastern entrance into the citadel of Gaur. The high arch is cusped, while the sides are paneled showing multi-cusped arches. It is a misnomer to call this a mosque, in actuality is a building to contain the prophet's foot prints in stone said to have been brought by a saint from Arabia. The building has a central square room with a wide verandah. The eastern facade is highly decorated. The central room is covered by a single dome, crowned with a lotus finial. There is no mihrab inside. An inscription over the front door records its erection by Sultan Nusrat Shah son of Husain Shah in AD 1531. 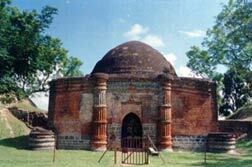 This Bengali thatched hut-shaped brick-building, built between c.1658 to 1707 AD is situated within the enclosure of Quadam Rasul Mosque. Fath Khan was the son of Dilir Khan who was sent by emperor Aurangzeb to kill saint Shah Niamatullah, whom he suspected of advising Shah Shuja, his brother to rebel. On arriving at Gaur, Fath Khan vomited blood and died, thereby vindicating the honour of the saint. In consideration of the time of struggle between Aurangzeb and Shuja the death of Fath Khan occurred sometime between AD 1657 and 1660. This brick-built Mosque ia an oblong building with stone columns in double aisles and was originally covered with 10 domes, 5 in each row. It has also bold floral panels on its surface. Its ornamentation is rich and effective, and the large decorated panels stand out in high relief against the plain walls. Tantipara means the quarter for the weaver class. This mosque was probably built by Mirshad Khan in 1480 AD. 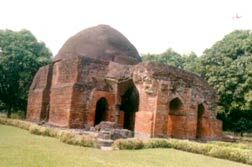 This two tombs in front of Tantipara Masjid are of unknown origin. 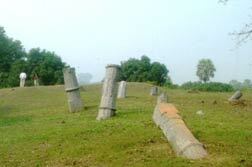 Two nice stone pillars are standing near the 7th Milestone on the Nawabganj Road. They are very similar to the stone columns of the Great Golden or Baraduari Mosque and most probably once formed part of the Mosque. These were probably built in c.16th century AD. 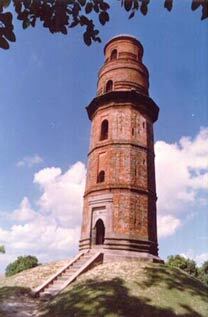 This brick-built tower stands on a eight-armed platform and is studded with something like elephant tusks in stone. The height of the extant two storeys is 55' and it was probably used as a Watch or Signal Tower probably built in c.16th century AD. A spiral staircase inside leads to the top. This brick built Mausoleum is the most beautiful building in this place. It forms a square roofed by a dome with a small turret at each corner. The inside plan of the structure is octagonal. The walls are exquisitely ornamented in the outer part by carved tiles and decorative motifs on bricks. Tradition runs that this construction cost 1 lakh rupees so the name. Amongst the three graves inside, one is regarded as tomb of Sultan Jalaluddin, son of Raja Kans, the other two of his wife and son Ahmad Shah. There is divergence of opinion among scholars about the identification and orientation of the graves. This structure was probably built in the early c.15th century AD. This Masjid was built by Makhdum Sheikh in c.1582 AD. It was built of brick and stone and had ten domes. The roof has fell down, but the walls and pulpit are standing. 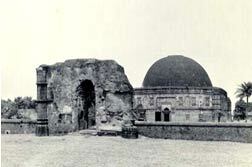 It was called Qutub Shahi Masjid as a mark of respect to the Saint Noor Qutb Ul Alam.